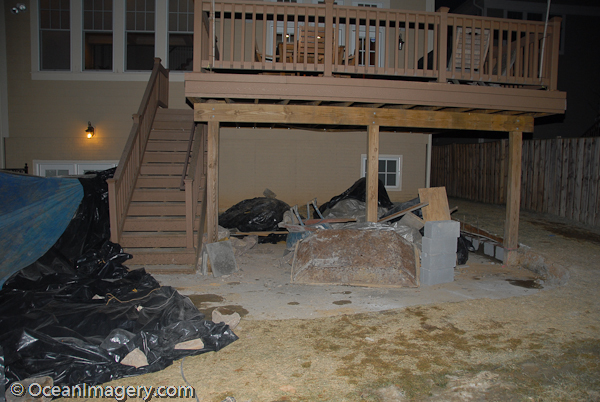 We decided to go ahead and start our patio project this past fall in hopes that it would be finished and ready for our T.G.I.S Party this coming spring. The landscaping company we’re using, Land Art Design, insured us that laying a patio and doing minor landscaping in the winter time is no problem and actually works out better as long as we don’t get any major snow storms. So after several weeks of designing, planning and kicking around numbers, Laura and her team showed up to break ground and start the first phase of the project project. Now… almost two months into it, the project is really starting to come together and so far I must say we have been truly pleased! We just can’t say enough about the quality and workmanship shown by the people at Land Art Design and we’re really looking forward to using our new outdoor living space for many years to come! Thanks Laura…!! Dylan’s first New Years Eve… Watching the ball drop on TV! Happy New Year Everyone!! We took a year off from our normal evening out to stay in and celebrate the ball dropping with Dylan. Yeah, we could have gotten a babysitter and gone out on the town, but it was Dylan’s first New Years Eve, so we elected to spend it with the little guy! 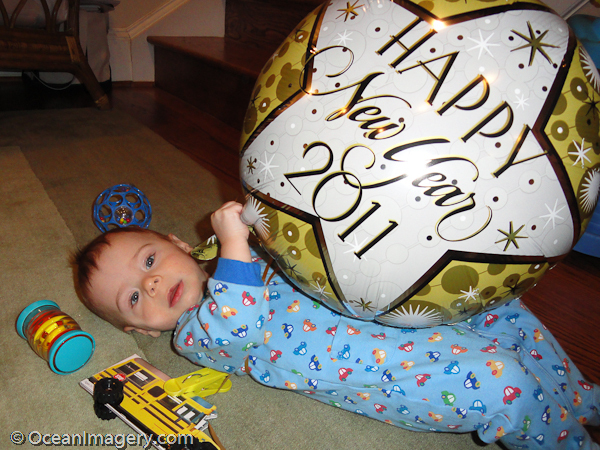 Julie got Dylan a festive balloon for the occasion and we gave him his first taste of champagne at the stroke of midnight…. unfortunately, the champagne Julie bought really wasn’t very good and Dylan didn’t care for the taste at all. The next day, we all made the drive down to my parents place for our annual New Years family dinner. Mike and Julia were there for the occasion and Dylan got a chance to play with my brothers dog, Neema, while we waited for my mothers food to hit the table. It was a wonderful dinner and a great start to what we hope will be a fantastic New Year for all of us!